Major General Chester E. McCarty of Portland, Oregon, assumed duties as chief of staff for U.S. Air Forces in Europe in February 1963. He came to Germany from Headquarters U.S. Air Force, Washington, D.C., where he served an assistant chief of staff for Reserve Forces. General McCarty was born in 1905 in Pendleton, Ore., and graduated from Northwestern College of Law in Portland in 1929. Active in the Oregon National Guard for many years, he advanced from an Infantry private to battery commander of Artillery, holding all enlisted ranks through master sergeant. His reserve commissioned status dates from 1926. Assistant attorney general of Oregon from 1930 to 1936, General McCarty was elected state senator in 1942, but declined to serve when he was called to active duty as an Army Air Corps captain that same year. During World War II, he served as squadron commander and operations officer at Morrison Field, Florida, and at Borinquen Field, Puerto Rico. He was a staff officer with the North African Wing of the Air Transport Command, and later, commander of a chain of air bases in the Middle East. On his return to the United States in 1945, he commanded the "brass hat" transport group at Washington National Airport. 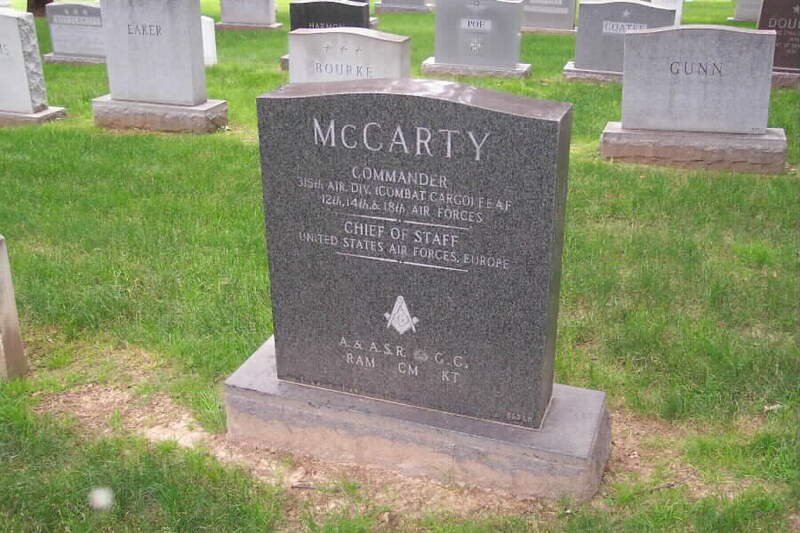 Returning to civilian life in 1946, General McCarty resumed practice as head of a Portland law firm, and became active in the Air Force Reserve as commander of the 305th Air Division and later of the 403d Troop Carrier Wing. He was national president of the Air Reserve Association from 1949 to 1950.
including support for the massive airdrops at Dien Bien Phu. from Alaska to Baffinland, and directed TAC airlift operations throughout the world with a fleet of C-124s, C-130s and C-123s. He was pilot of the first Air Force plane to fly over the South Pole on October 26, 1956, airdropping the first load of buildings, supplies and equipment for the base at the South Pole on Operation Deep Freeze. From 1957 to 1959, General McCarty commanded Tactical Air Command's Twelfth Air Force at Waco, Texas, the world's first all supersonic force. In 1958, be deployed a major TAC composite air strike force to the Far East during the Formosa Straits crisis, many of the force of jet fighter, bomber and reconnaissance aircraft crossing the Pacific in less than 17 hours flying time by air-to-air refueling. General McCarty assumed command of the Fourteenth Flying Tiger Air Force at Robins Air Force Base, Georgia, in October 1959 after five years as a TAC Air Force commander. A year later the unit was discontinued as part of a general reorganization of the Continental Air Command and General McCarty assumed his Pentagon position. General McCarty is a command pilot with more than 12,000 flying hours, including 469 hours of combat time. He has flown almost every type of Air Force aircraft, including the supersonic F-100 and F-104 jet fighters, and has piloted many types of airlines jet aircraft. Residence: Redmond, Washington, Section 30, Grave 562-LH. Buried in Arlington National Cemetery on 05/24/1999. 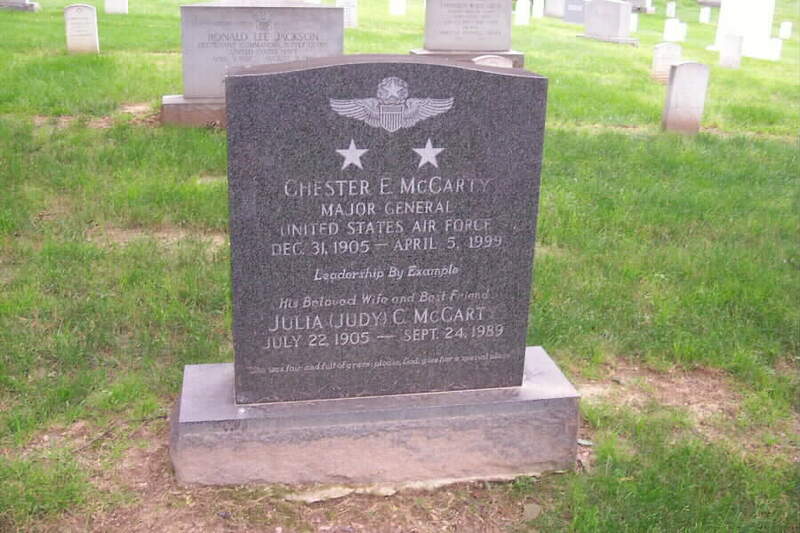 His wife, Julia Carolina McCarty, Born: 07/22/1905, Died: 09/24/1989, US Navy, GM3, Residence: Portland, Oregon, was buried in the same location on 29 September 1989.